While she waits for her uncle, she jumps rope, plays games with her friends and watches the goings-on in her neighborhood. Mothers hold their young children’s hands as they walk to the corner bodega to buy groceries. Boys and girls ride bikes and play stickball. Older people sit at their windows and enjoy the sights and sounds of their community. And coming from far up the block where water sprays from an open fire hydrant, Teresita finally hears the sound of her uncle’s voice. What will her surprise be?!? Set in a Puerto Rican neighborhood in New York City, this bilingual picture book for children ages 4 – 8 captures both the daily life of an urban community and a child’s excitement about her birthday surprise. Children will be inspired to look at—and maybe even write about—their own neighborhoods with new eyes. VIRGINIA SÁNCHEZ-KORROL, professor emerita at Brooklyn College of the City University of New York, is the author of several books including Feminist and Abolitionist: The Story of Emilia Casanova (Piñata Books, 2013) and From Colonia to Community: The History of Puerto Ricans in New York City (1994). Sánchez-Korrol writes a blog about Puerto Ricans and Latinas in the United States for The Huffington Post. This is her first picture book. 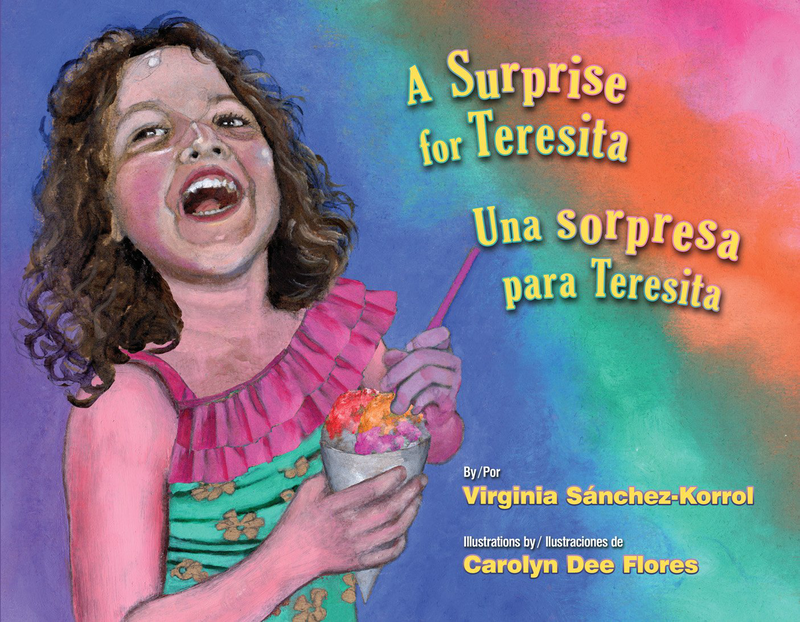 CAROLYN DEE FLORES is the illustrator of Dale, dale, dale: Una fiesta de números / Hit It, Hit It, Hit It: A Fiesta of Numbers (Piñata Books, 2014) and Canta, Rana, canta / Sing, Froggie, Sing (Piñata Books, 2013), both of which were named to the Texas Library Association’s Tejas Star Reading List. A member of the Society of Children’s Book Writers and Illustrators, she lives in San Antonio, Texas. Magnifica noticia! Esperamos a teresita. Great news! We are waiting for Teresita.